Rarely can an author crack my list of favorites with just a single work but somehow, Lyanda Lynn Haupt did. More than 3 years ago, I reviewed her fabulous narrative of Charles Darwin’s explorations of the Americas, Pilgrim on the Great Bird Continent. I’ve thought often of that book since then, savoring the memory of Ms. Haupt’s evocative writing. This explains why I was so excited to receive a review copy of her newest book, Crow Planet. After taking months to really absorb this thoughtful work, I can assure you she is still at the top of my list. 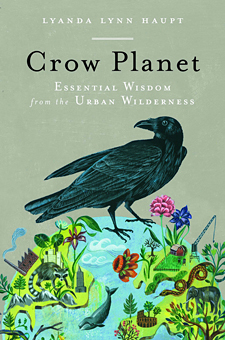 Crow Planet: Essential Wisdom from the Urban Wilderness is ostensibly about crows but more widely about the world in which we live and how we live in it. Crows present the perfect platform from which to explore the interactions between humans and everything we consider wild because these constant corvid companions always seem to be right there with us. Lyanda Lynn Haupt has recognized that, while looking into the spirits of creatures as paradoxically untamed and urbanized as we are, she is able to catch glimpses of our own collective soul. When it comes to Crow Planet, there is truth is advertising; readers will learn more than they probably think possible about crows, specifically the ubiquitous American Crow. Yet herein is also contained a truly inspired “Crash Course for the Urban Naturalist” which should be essential reading for denizens of city and country alike. Ms. Haupt also explores themes of ethics, interconnectedness, observation, and a hundred other sublime threads all connecting us to crows. Her writing is pithy, personal, and, above all, professional; this author knows her way around the English language. Over the last few millennia, humanity has transformed this world, rendering huge swathes of habitat unfit for most creatures while leaving the provenance of adaptable crows in its wake. If your environment, be it urban, suburban, or rural is anything like mine, you encounter crows on a daily basis. Ms. Haupt does as well but unlike the rest of us, she has somehow allowed crows to transport her to higher levels of consciousness. Crow Planet will, if you allow it, transport you there as well.